Our family of six stayed 7 nights at Mare Gailard villa in January 2019. This was a first time for us visiting Guadeloupe. We had most amazing time at this property and with exploring the island. 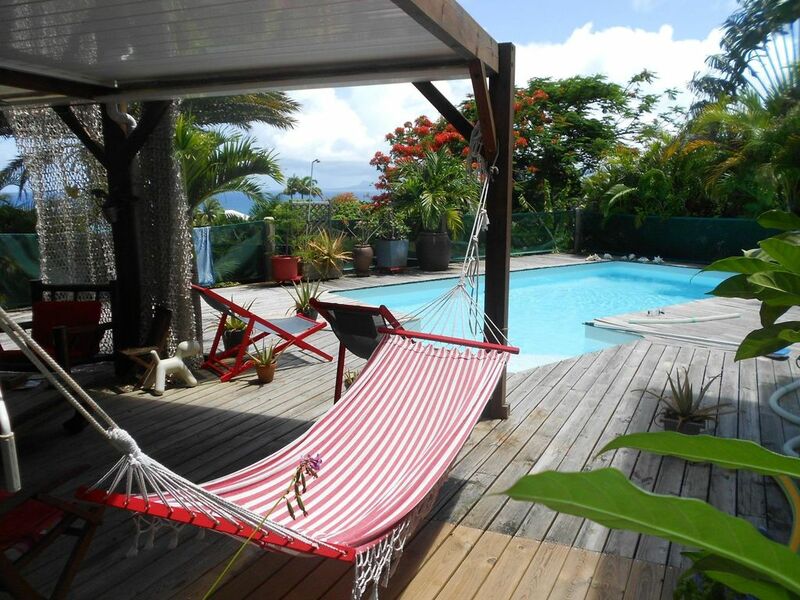 Home is conveniently located between Le Gosier and Sainte Anne cities, and about 40-50min drive from airport. Nearest local beaches are only within 5min drive. Property location and setup is very private, secure, and offers beautiful scenery and ocean views. Pool is perfect for kids and adults, and it can be used anytime of day or night. House is well stocked and equipped, nice selection of music,CDs available as well. Owners speak English very well, they were very welcoming and helpful throughout our entire stay. They gave us some tips and advise what to visit and see on the island. Thank you Valerie & Vincent again for sharing your beautiful villa. We will be back! Fabulous home with great entertaining space. Love the indoor/outdoor living flow. Wonderful house.....great views.........terrific owners.......couldn't ask for more! Arrivé dans un lieux chaleureux, tenu par des propriétaires eux aussi fort sympathiques et attentionnés . Maison atypique et très bien conçue. Vacances avec des jeunes enfants qui eux aussi ont été charmé par cette maison qui nous offre confort, équipement approprié et sécurité. Merci à vous 5 d'avoir été aussi sympathiques tout au long du séjour. Et un grand merci encore d'avoir commencé à laver draps et serviettes avant votre départ et ce, sans qu'on ne vous l'ai demandé. Vu que les délais étaient courts, ça nous a permis une passation plus sereine. Ca fait tellement du bien de rencontrer de jeunes personnes respectueuses, bien élevées et cool à la fois. (Text automatically translated) At 25 minutes from the airport to Ste Anne exceed sections Pliane and St Felix, and turn right into Mare Gaillard, 50m before the pharmacy. To 400m in a descent to the dead straight, gray gate 50m on the left. (Text automatically translated) 2kms from the house, towards Ste Anne, Le Maho, Bar restaurant very "roots" concerts small super nice group on Thursday Friday and Saturday night. Ste Anne, The American idem, concerts on Saturday nights, cool atmosphere. 15mn, the Marina, many restaurant in the evening. Day, possible rental canoe or windsurf on the beach of Saline, just below the house, 5 minutes by car. (Accessible on foot in 15 minutes by small road but crossing the main road anyway, explanation to ask the owner). Lovely walks this Salines beach, up the St Felix) Very beautiful beach of La Caravelle (Club Med) 10 minutes by car from the house, at the entrance of St. Anne. Ste Anne local beach beautiful too. Beach at St. Felix very wild and with a nice walk as at end of the beach. (To beautiful 16/17h light) For low age children, counseling, visit The Park Udders for larger (12 / 16), opposite the tapper, zipline and adventure.